The Outer Banks has so much to do that it’s easy to overlook some of the best activities. For golfers, that may very well be the case, although local golf courses have built a reputation for great greens and beautiful scenery requiring a full range of skill levels. The courses are fairly close together—the longest ride between any of them is 45 minutes to an hour, depending on the season creating a perfect opportunity unity for a golf weekend or week. The courses also offer a remarkable variety of styles and difficulty, from the relatively easy, family-friendly Holly Ridge in Harbinger to the more challenging courses of Kilmarlic or the Currituck Club. All Outer Banks courses are open year around, although weather conditions do create some closures. If hitting the links in the summer, take water, sun repellant and bug spray. A Tom Steele designed course, Kilmarlic may be the most beautiful course of the Outer Banks group.The course seems to wander through a maritime forest of ancient live oak, pine and holly. 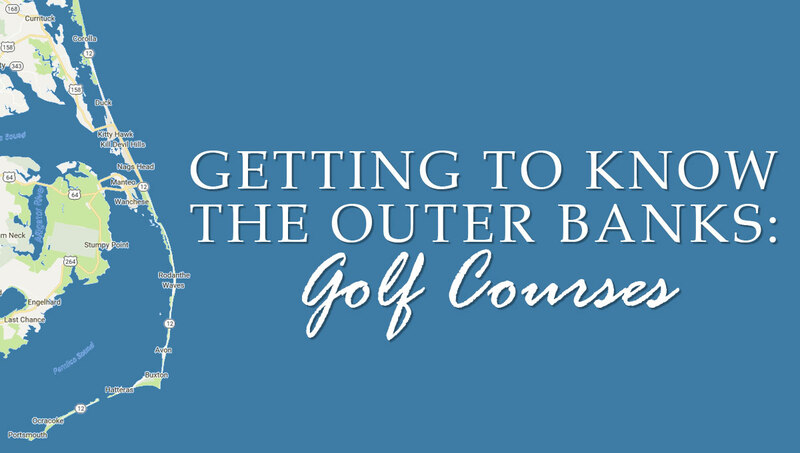 A challenging course with lots of water hazards, the course regularly hosts the ODU/OBX Golf Tournament in the fall, and has hosted other tournaments in the past. Also located on the grounds of Kilmarlic are tennis courts, pool and a full service gym. A well-maintained course with an open design and relatively short length make.The Pointe perfect for a relaxing few hours outdoors. The greens greens especially are well-maintained. Practice facilities include a driving range and putting greens. The staff gets consistently high marks in comments about the course. The clubhouse restaurant has a well-deserved reputation for good food at a reasonable price. Very much a beginners course. With the most reasonably priced green fees, Holly Ridge is very family-friendly, but more experienced golfers may enjoy other Outer Banks courses more. Wandering along the natural contours of the Outer Banks, this Rees Jones designed course has a bit of everything. Spectacular views of the Atlantic Ocean and Currituck Sound from the from the ridge lines that wander into the wetlands of a maritime forest. Often rated as one of the best courses in North Carolina. A challenging course, but not overwhelming is the general consensus. The first Outer Banks golf club, Duck Woods is an Ellis Maples design that opened in 1969. The course is very well-maintained. Not much elevation gain at all, but still has some challenges. Duck Woods Country Club is a full service private club, but check with staff; there are a couple of workarounds they have for golfers who want to get on the course. Excellent lunch and dinner at the clubhouse. The Sea Scape course follows the ridge line of relict sand dunes—which is another way of saying, it may be at the beach, but it is not flat. A challenging par 70 course, the exposed hill greens can get windy at times, which can make the somewhat narrow greens more difficult to play. Management has done a good job over the past few years of maintaining the greens. A true links style course bordering Roanoke Sound, everything about the conditions can change in a moment depending on wind direction and speed. Most golfers will find Nags Head Links challenging; more skilled players will enjoy the challenge of the wind conditions; novices will learn a lot. A very well-maintained course with beautiful views of Roanoke Sound.